Cetos seeks to better understand the behavior and ecology of marine mammals so that informed management decisions can be made. To this end, we have been conducting an ongoing study since 1996 of humpback whale behavioral ecology. This includes a focus on mother/calf behaviors and vocalizations. Findings from this study have provided important information to resource managers about the needs of these animals at a crucial time in their development. You can read more about the specifics of this study; See “Study Goals” and “Study Findings“. We have presented different findings from this work at the last few Biennial Conferences on the Biology of Marine Mammals given by the Society of Marine Mammalogy. 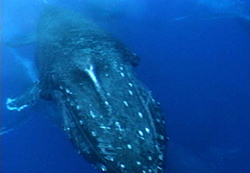 Most previous research on humpback whale vocalizations focused on their well known song. We have studied humpback song but decided to focus on other calls. 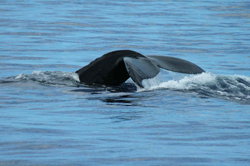 Cetos initiated the modern period of study of humpback whale social vocalizations; these calls are less well understood. We have been studying social calls for many years using various acoustic techniques and published the first ever verification on calf social calls. To hear a sample of these sounds, go to our Sounds page. In addition, we are collecting data on the underwater activities of wintering humpback whales and developing an underwater ethogram.